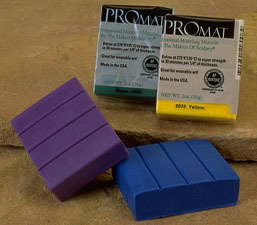 ProMat is a perfect modeling medium for those wanting a slightly firmer, extremely durable polymer clay. It may well be the strongest, most durable of polymer clays. It bakes to a hard finish, retaining amazing flexibility in thin areas, rather than being brittle. Conditioning is not as easily accomplished as the other Polyform Product clays but is generally much easier than Fimo and somewhat easier than Cernit . Initially, it feels hard and unyielding but as you hold it and begin kneading the clay, you'll find it quickly responds to the warmth of your hands. Promat is available in thirty colors packaged in 2 ounce bars. It is the only polymer clay line featuring a lustrous Gold and Silver making it perfect for use in jewelry. Other recommended uses include buttons, wearable art, home decor and items which require its greater strength. It is perfectly suitable for use in millefiore as well. For best results, produce canes no larger than 5" across. The reason for the size restriction is the heat reactive nature of the clay; when reducing the cane, the outside of the cane "moves" as it responds to the heat from your hands while the center remains firm. fyi: Buttons made with Promat can be washed in your clothes washer but should not be subjected to the heat of a dryer. Never dry clean polymer clay! Cleaning fluid may melt the buttons. Do you have questions about Promat or polymer clay? Feel free to email Donna Kato, Polyform's in-house artist, for help.